After spending extended time in the relative solitude of Canada’s national parks, we turned south to Ohio. For the heck of it, we decided to spend a few days in Maine to visit Acadia National Park, and eat lobster. There is lobster to be had in Canada of course, but in the Maritimes they eat their lobster cold. They have learned that Americans like lobster hot, so you are asked if you’d like your lobster warm. If you answer ‘yes,’ then a cold cooked one is dropped into a vat of boiling water for a bit to reheat it. Sorry to say, it’s just not the same. We love our lobster freshly steaming hot out of the pot with drawn butter, so to Maine we went. Now it’s Saturday afternoon, as I sit here looking out at the ocean, I wonder what we could have been thinking. It’s Labor Day weekend, and we are at the Oceanside KOA in Bar Harbor Maine. We arrived late in the afternoon to find out it is “pirate weekend” and the staff were festooned with eye patches, bandannas with fake earrings and plastic swords, and saying clever pirate stuff like: “Arghh, matey!” After you register, a KOA staff (in our case, Pirate Bill) escorts you to your campsite to help you park, which means they are there to make sure you don’t encroach on your neighbor’s precious few feet of rented real estate. That being said, this KOA is positively generous with its campsites. There is enough room for everyone to put out their slides and awnings. To be sure, if you need a place to flop your motorhome for a few days where you have easy access to the park and Bar Harbor, the Oceanside KOA is the place. The staff is helpful and friendly, and if you have kids, this is a great place. For me though, the forced intimacy is culture shock. We and about 400 of our new best friends are lined up like so many sardine tins along a beautiful coastline. As long as I look straight ahead, the scenery is lovely. Next to and behind us in any direction is controlled chaos. On the plus side, dogs are allowed to swim on the surrounding beaches here in Maine, whereas in Canada national parks they were not. Ryder is having a good time out-swimming and stealing water toys from other dogs as I write this. 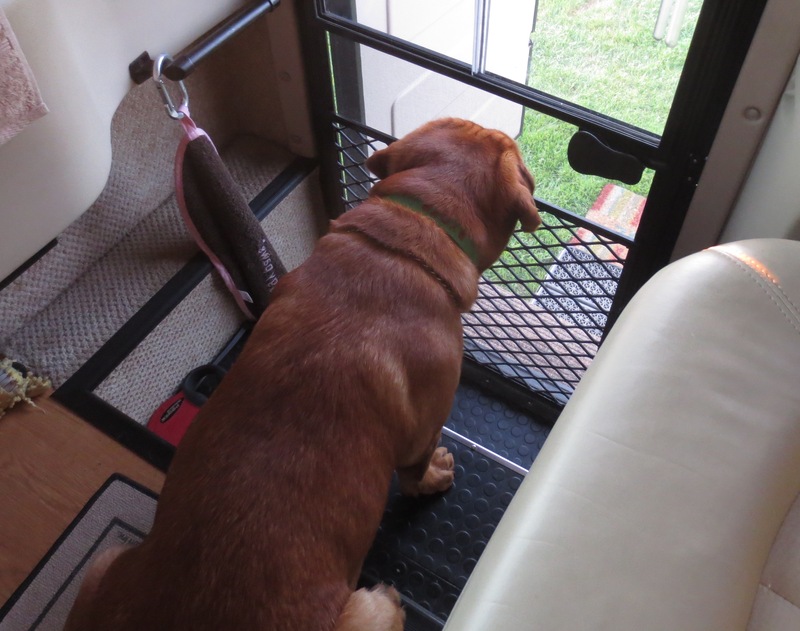 Ryder checks out the competition at the KOA. Our KOA neighbors are a gregarious lot. Within minutes of arriving, we’d met most of them. Behind us are Cathy and Jerry from Canton(!) Ohio, two doors down are a couple who are from Lancaster Ohio. The husband takes a ritual bath in the salt water each morning. One woman wobbled over with a very full cup to say howdy and tell us where all the “fun people” were located. This morning they are shaking off their hangovers with bloody marys. Ben is trolling the KOA to collect intelligence about various brands of motor coaches. As he chats up people he is happy as a clam. Last night we met an elderly Scottish couple who built an enormous campfire next to their motor home. Ben chatted with them briefly, but the heat and smoke of their fire drove me away. The flames leaped several feet in the air and lit up their campsite. I would suspect them to be Druids, but it’s the wrong time of the year for a Solstice bonfire. I went to bed thinking it would be a long three nights at the KOA. That was yesterday. This morning there was an exodus out of the campground (or, should I say “Kampground”) and we are looking at an unobstructed view of the ocean. A handful of trailers remain. The families have gone home, I imagine, to arrive in time for grilling burgers on Monday and early to bed. It will be a school night after all. Bar Harbor, which is usually gridlocked, was busy but pleasant on a sparkling late summer day. Ben and I spent the day strolling the streets and walking along the coast. Tomorrow we will kayak in the bay. Many of the shops will be closed tomorrow, and then after leaf peeping season most will close for the winter. Tonight we will relax in our new beachfront property, and get ready for our own migration home. On the morning we were preparing to get under way, a man came by and asked if we had a spare part for his water valve. Ben, being a car guy, had not only the part but tools as well. It turned out that that man and his wife were from Prince Edward Island. Within a few minutes, we had a bag of scallops harvested by his brother, a phone number and email address and an invitation to come to the island and camp at his house. He is a lifelong PEI resident, and in retirement lived on a boat for six years until his ‘daughter started having children and my wife got these grandmother hormones, so no more sailing off, eh?’ They sold the boat and bought an RV. They head south in August to extend their summer of hiking and kayaking. Now we’re on the road, taking secondary streets through Maine and Massachusetts. Places we pass are festooned with banners announcing ‘End of Summer SALE!’ or, ‘closed for the season, THANKS!’ The leaves haven’t started to turn just yet, but for people who can’t outrun winter, summer is over. Love reading of your continuing adventures. Call when you get home and are unpacked. We need to plan our yearly dinner. Ed & Bobbie want to attend!